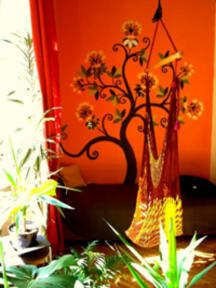 Welcome to Mandala, a small, home-style hostel located in downtown Budapest. 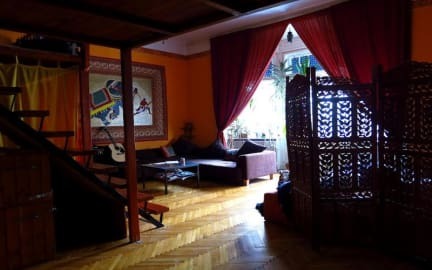 Perfect for the solo traveller or small groups looking for a place to meet new friends, relax, and take in the city without the craziness of a party hostel. The hostel is run by travellers who are more than happy to share their knowledge of Budapest and beyond. Our reception is open from 8am to 10pm, please send us an email or indicate in your arrival time if you plan to arrive outside of these hours. The Orange, Purple, and Green apartment are in a building separate from the hostel. We have two CATS and a DOG who are very friendly and love attention but if you do have allergies, consider booking at our apartments which is an animal-free zone. We offer an eight bed (Mush Room) and a six bed dorm (Zen Room), both are ideal for couples or solo travellers. Our eight bed dorm makes it near impossible not to make new friends with an open layout and a very, very comfortable couch to laze around on through the day. The six bed dorm offers a quieter, calmer space to relax and recuperate after a day of sight-seeing. Both of our dorms are without bunk-beds! There is also the private room, Domino, ideal for couples or groups of three. It includes a king size bed and a pull out couch, windows that open out onto the courtyard. If you want privacy but still to be in the mix of hostel life, this is the perfect room for you. With a shared bathroom. ORANGE ROOM: a large double bed with plenty of space to relax, two armchairs, and windows that open out onto the central courtyard. All three rooms share a large communal kitchen, sitting area, bathroom, and separate W/C. Equipped with everything you’ll need including WiFi, laundry, towels. A calm space away from the city bustle with privacy when wanted and a space to socialise with the other guests. Sorry, no groups please - maximum of 4 people per booking. Super cozy hostel, great staff, free towel and padlock, lovely animals.. was really nice to feel like beeing part of a family..:) and was a really good option as l wanted to go out for concerts but have some quite nights as well..
Great atmosphere, great staff, nice cosy hostel. It's the perfect place if you're traveling alone. The place is REALLY quiet and very central in Budapest, close to everything. It's a really great hostel, the only thing could be improved is the privacy that is lacking since the beds are in the middle of the chill out room and that made me a little bit uncomfortable once I was there. Generally a really good hostel! If you like small and cozy hostel, this is the place! there is space for everything, from the relax to the party time. The people here is amazing and is really easy to hang out with who ever you want. All the hostel is really clean and safe, if i will come back to Budapest i will come back here for sure! The hostel is nice and managed by very nice guys that have been helpful with useful informations about sightseeings, transportations, shops, cash change and so on. Moreover, they have been really kind to allow me to leave my luggage in their closet even after my check-out, so that I could still walk around the city until evening without the annoyance of carrying 3 bags with me! In general, considering the price and the quality of se I am very satisifed of my 2 nights spent to the Mandala hostel!